Pull up a lounge chair and prep the grill. With summer in full swing, there's no better time to outfit your outdoor space with a fleet of new designs. 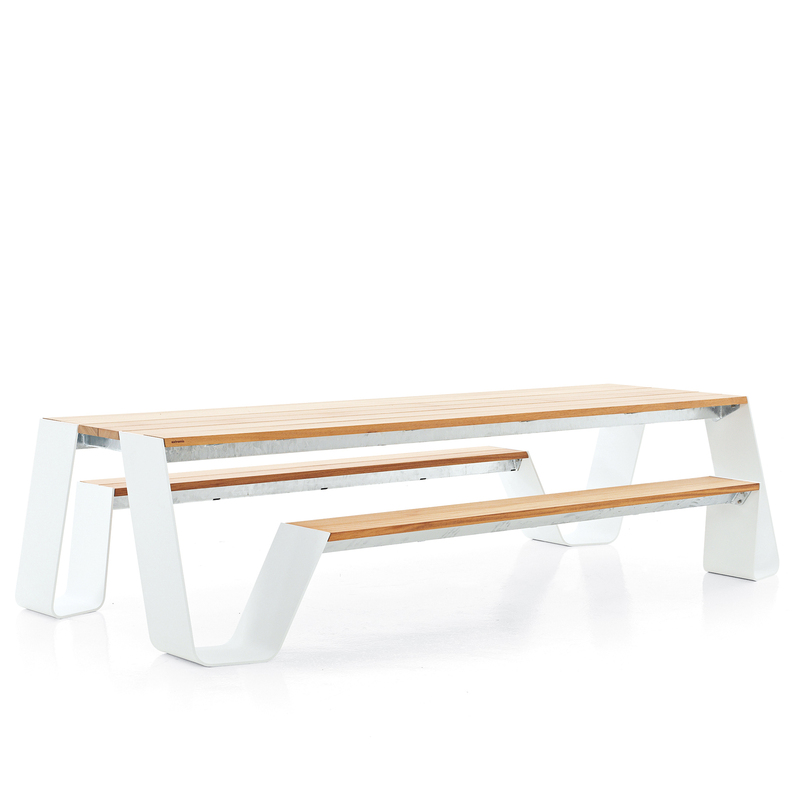 The Hopper table is a turbocharged version of the traditional picnic table, with modern materials (powder-coated aluminum, iroko wood), a bent form that facilitates easy entry and egress, and four sizes that can seat up to ten. For flexible outdoor seating, CB2 offers up this handsome and affordable pouffe. The Egg Birdhouse by designer Jim Schatz gives small birds like chickadees and wrens a colorful, modern, and durable home. Available in eight glossy colors. Find this item at the Dwell Store. Spanish-born, Milan-raised designer Patricia Urquiola is widely responsible for making contemporary outdoor furniture just as appealing as its high-design interior counterparts. This aluminum-framed mini-cottage with balau-wood slats is no exception: Urquiola describes it as "the definitive refuge in which to enjoy the outdoors." This lounger uses FSC-Certified recycled teak and very durable Sunbrella cushions. It's very comfortable and works well with the rest of the Icon outdoor line. Comes in 6 different colors. Just browsing the cheery selection of enamel-coated steel charcoal barbeques from Bodum boosts our spirits with thoughts of the next afternoons spent grilling hot dogs and hamburgs in the breeze. A classic design by Richard Schulz, the Swell Seating Collection and its pieces are nearly all made in Pennsylvania. The specialized sewing necessary to produce the slings that make up the seats is done at Schultz HQ in Palm, Pennsylvania, in a converted glove factory. Even the vendor who makes the cardboard boxes for shipping this outdoor furniture is located just down the road.